Acute stress disorder (ASD) is an anxiety disorder characterized by a cluster of dissociative and anxiety symptoms that occur within a month of a traumatic stressor. It is a relatively new diagnostic category and was added to the fourth edition of the Diagnostic and Statistical Manual of Mental Disorders (DSM-IV) in 1994 to distinguish time-limited reactions to trauma from the farther-reaching and longer-lasting post-traumatic stress disorder (PTSD). Published by the American Psychiatric Association, the DSM contains diagnostic criteria, research findings, and treatment information for mental disorders. It is the primary reference for mental health professionals in the United States. ASD, like PTSD, begins with exposure to an extremely traumatic, horrifying, or terrifying event. Unlike PTSD, however, ASD emerges sooner and abates more quickly; it is also marked by more dissociative symptoms. If left untreated, however, ASD is likely to progress to PTSD. Because the two share many symptoms, some researchers and clinicians question the validity of maintaining separate diagnostic categories. Others explain them as two phases of an extended reaction to traumatic stress. The immediate cause of ASD is exposure to trauma—an extreme stressor involving a threat to life or the prospect of serious injury; witnessing an event that involves the death or serious injury of another person; or learning of the violent death or serious injury of a family member or close friend. The trauma's impact is determined by its cause, scope, and extent. Natural disasters (floods, earthquakes, hurricanes, etc.) or accidents (plane crashes, workplace explosions) are less traumatic than human acts of intentional cruelty or terrorism. Terrorist-inflicted trauma appears to produce particularly high rates of ASD and PTSD in survivors and bystanders. Although most people define trauma in terms of events such as war, terrorist attacks, and other events that result in vast loss of life, the leading cause of stress-related mental disorders in the United States is motor vehicle accidents. Most Americans will be involved in a traffic accident at some point in their lives, and 25% of the population will be involved in accidents resulting in serious injuries. The National Comorbidity Survey of 1995 found that 9% of survivors of serious motor vehicle accidents developed ASD or PTSD. Age—Older adults are less likely to develop ASD, possibly because they have had more experience coping with painful or stressful events. Previous exposure—People who were abused or experienced trauma as children are more likely to develop ASD (or PTSD) as adults, because these may produce long-lasting biochemical changes in the central nervous system. Biological vulnerability—Twin studies indicate that certain abnormalities in brain hormone levels and brain structure are inherited, and that these increase a person's susceptibility to ASD following exposure to trauma. Support networks—People who have a network of close friends and relatives are less likely to develop ASD. Perception and interpretation—People who feel inappropriate responsibility for the trauma, regard the event as punishment for personal wrongdoing, or have generally negative or pessimistic worldviews are more likely to develop ASD than those who do not personalize the trauma or are able to maintain a balanced view of life. Reexperiencing the trauma in recurrent dreams, images, thoughts, illusions, or flashbacks; or intense distress when exposed to reminders of the trauma. A marked tendency to avoid people, places, objects, conversations, and other stimuli reminiscent of the trauma (many people who develop ASD after a traffic accident, for example, refuse to drive a car for a period of time). Hyperarousal or anxiety, including sleep problems, irritability, inability to concentrate, an unusually intense startle response, hypervigilance, and physical restlessness (pacing the floor, fidgeting, etc.). Significantly impaired social functions and/or the inability to do necessary tasks, including seeking help. Symptoms last for a minimum of two days and a maximum of four weeks, and occur within four weeks of the traumatic event. The symptoms are not caused by a substance (medication or drug of abuse) or by a general medical condition; do not meet the criteria of a brief psychotic disorder ; and do not represent the worsening of a mental disorder that the person had before the traumatic event. People with ASD may also show symptoms of depression including difficulty enjoying activities that they previously found pleasurable; difficulty in concentrating; and survivor's guilt at having survived an accident or escaping serious injury when others did not. The DSM-IV-TR (revised edition published in 2000) notes that people diagnosed with ASD "often perceive themselves to have greater responsibility for the consequences of the trauma than is warranted," and may feel that they will not live out their normal lifespans. Many symptoms of ASD are also found in patients with PTSD. Acute responses to traumatic stressors are far more widespread in the general United States population than was first thought in 1980, when PTSD was introduced as a diagnostic category in the DSM-III . The National Comorbidity Survey, a major epidemiological study conducted between 1990 and 1992, estimated that the lifetime prevalence among adult Americans is 7.8%, with women (10.4%) twice as likely as men (5%) to be diagnosed with trauma-related stress disorders at some point in their lives. These figures represent only a small proportion of adults who have experienced at least one traumatic event—60.7% of men and 51.2% of women respectively. More than 10% of the men and 6% of the women reported experiencing four or more types of trauma in their lives. The prevalence of ASD by itself in the general United States population is not known. A few studies of people exposed to traumatic events found rates of ASD between 14% and 33%. Some groups are at greater risk of developing ASD or PTSD, including people living in depressed urban areas or on Native American reservations (23%) and victims of violent crimes (58%). ASD symptoms develop within a month after the traumatic event; it is still unknown, however, why some trauma survivors develop symptoms more rapidly than others. Delayed symptoms are often triggered by a situation that resembles the original trauma. ASD is usually diagnosed by matching the patient's symptoms to the DSM-IV-TR criteria. The patient may also meet the criteria for a major depressive episode or major depressive disorder . A person who has been exposed to a traumatic stressor and has developed symptoms that do not meet the criteria for ASD may be diagnosed as having an adjustment disorder . As of 2002, there are no diagnostic interviews or questionnaires in widespread use for diagnosing ASD, although screening instruments specific to the disorder are being developed. A group of Australian clinicians has developed a 19-item Acute Stress Disorder Scale, which appears to be effective in diagnosing ASD but frequently makes false-positive predictions of PTSD. The authors of the scale recommend that its use should be followed by a careful clinical evaluation. Therapy for ASD requires the use of several treatment modalities because the disorder affects systems of belief and meaning, interpersonal relationships, and occupational functioning as well as physical well-being. Medications are usually limited to those necessary for treating individual symptoms. Clonidine is given for hyperarousal; propranolol , clonazepam , or alprazolam for anxiety and panic reactions; fluoxetine for avoidance symptoms; and trazodone or topiramate for insomnia and nightmares. Antidepressants may be prescribed if ASD progresses to PTSD. These medications may include selective serotonin reuptake inhibitors (SSRIs), monoamine oxidase inhibitors (MAOIs), or tricyclic antidepressants. Immediate crisis intervention after a tragedy or natural disaster may help victims express their feelings and fears and may help them to avoid developing acute stress disorder and post-traumatic stress disorder. 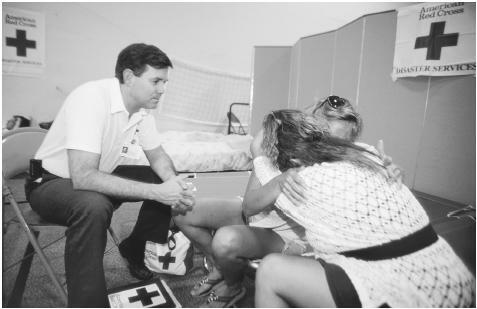 Here, victims of a 1993 flood in Missouri receive counseling. therapy appears to be three to four times as effective as supportive therapy in preventing ASD from progressing to PTSD. This treatment combines cognitive restructuring of the traumatic event with exposure to disturbing images and techniques for anxiety management. In addition, it can help patients identify and reinforce positive aspects of their experience. For example, some people find new strengths or talents within themselves in times of crisis, or discover new spiritual resources. Group and family therapies also appear to help patients with ASD reinforce effective strategies for coping with the trauma, and may reduce the risk of social isolation as a reaction to the trauma. They give patients opportunities to describe what happened and how they responded; they also let patients receive warmth and caring from their listeners, and help put memories of the event into a coherent narrative, allowing them to integrate the trauma into their overall lives. Critical incident stress management (CISM) is a comprehensive crisis-intervention system in which a team of specially trained practitioners comes to the site of a traumatic event and provides several different forms of assistance, including one-on-one crisis support; crisis management briefing, which is a 45–75-minute intervention for groups of people affected by the traumatic event; and critical incident stress debriefing, which is a structured group discussion of the event. CISM appears to be particularly helpful in preventing burnout and ASD in emergency service personnel, rescue personnel, police, and other caregivers who are involved in treating survivors of a traumatic event. Many mainstream practitioners recommend holistic or naturopathic approaches to recovery from ASD, including good nutrition with appropriate dietary supplements and regular exercise. Yoga and some forms of body work or massage therapy are helpful in treating the muscular soreness and stiffness that is often a side effect of the anxiety and insomnia related to ASD. Hydrotherapy is often helpful for post-traumatic muscular aches and cramps. A skilled naturopath may also recommend peppermint or other herbal preparations to calm the patient's digestive tract. In addition, prayer, meditation , or counseling with a spiritual advisor have been found to be helpful in treating patients with ASD whose belief systems have been affected by the traumatic event. Very little is known about the prevalence of ASD or PTSD in children, and even less is known how effectively medications and psychotherapy treat these disorders in this age group. There are as yet no standardized screens or diagnostic interviews in widespread use for assessing either ASD or PTSD in children, although a Child Post-traumatic Stress Reaction Index was published in 1992. One preliminary study recommends the cautious use of low doses of i mipramine for treating children with ASD, but notes that research in this area has barely begun. Untreated ASD is highly likely to progress to PTSD in children as well as in adults. One team of Australian researchers found that 80% of persons diagnosed with ASD met criteria for PTSD six months later; 75% met criteria for PTSD two years after the traumatic event. In addition to developing PTSD, people diagnosed with ASD are at increased risk of developing a major depressive disorder, particularly if their emotional responses to the trauma were marked by intense despair and hopelessness. Other sequelae may include neglect of personal needs for health or safety; and impulsive or needlessly risky behavior. Some forms of trauma, such as natural disasters and accidents, can never be completely eliminated from human life. Traumas caused by human intention would require major social changes to reduce their frequency and severity, but given the increasing prevalence of trauma-related stress disorders around the world, these long-term changes are worth the effort. In the short run, educating people—particularly those in the helping professions— about the signs of critical incident stress may prevent some cases of exposure to trauma from developing into ASD and progressing to full-blown PTSD. "Acute Stress Disorder." Section 15, Chapter 187. In The Merck Manual of Diagnosis and Therapy , edited by Mark H. Beers, MD, and Robert Berkow, MD. Whitehouse Station, NJ: Merck Research Laboratories, 2001. Herman, Judith, MD. Trauma and Recovery. 2nd ed., revised. New York: Basic Books, 1997. Bowles, Stephen V. "Acute and Post-Traumatic Stress Disorder After Spontaneous Abortion." American Family Physician 61 (March 2000): 1689-1696. Bryant, R. A. "The Acute Stress Disorder Scale: A Tool for Predicting Post-Traumatic Stress Disorder." Australian Journal of Emergency Management (Winter 1999): 13-15. Butler, Dennis J. "Post-Traumatic Stress Reactions Following Motor Vehicle Accidents." American Family Physician 60 (August 1999): 524-531. Harbert, Kenneth. "Acute Traumatic Stress: Helping Patients Regain Control." Clinician Reviews 12 (January 2002): 42-56. Marshall, R. D., R. Spitzer, and M. R. Liebowitz. "Review and Critique of the New DSM-IV Diagnosis of Acute Stress Disorder." American Journal of Psychiatry 156 (1999): 1677-1685. Robert, Rhonda. "Imipramine Treatment in Pediatric Burn Patients with Symptoms of Acute Stress Disorder: A Pilot Study." Journal of the American Academy of Child and Adolescent Psychiatry 38 (July 1999): 1129-1136.
van der Kolk, Bessel. "The Body Keeps the Score: Memory and the Evolving Psychobiology of PTSD." Harvard Review of Psychiatry 1 (1994): 253-265. American Academy of Experts in Traumatic Stress. 368 Veterans Memorial Highway, Commack, NY 11725. Telephone: (631) 543-2217. Fax: (631) 543-6977. <www.aaets.org> . International Society for Traumatic Stress Studies. 60 Revere Drive, Suite 500, Northbrook, IL 60062. Telephone: (847) 480-9028. Fax: (847) 480-9282. <www.istss.org> . Society for Traumatic Stress Studies. 60 Revere Dr., Ste. 500, Northbrook, IL 60062. (708) 480-9080.